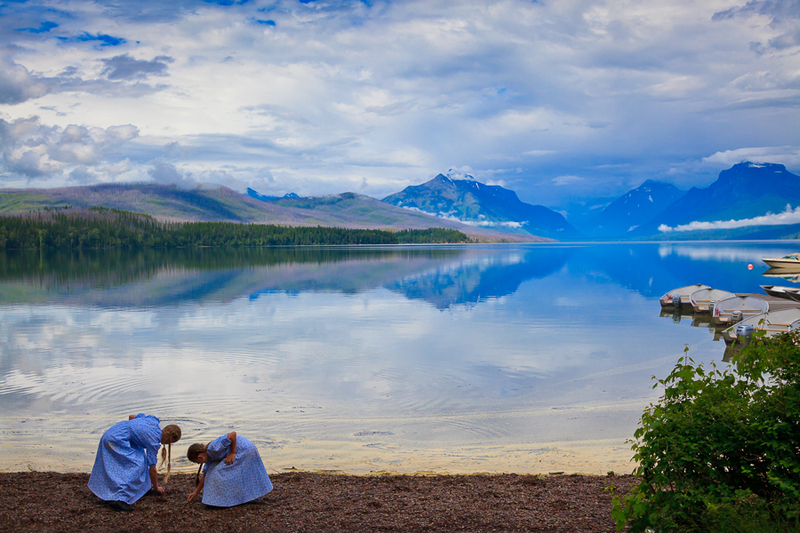 Sometimes a road trip is just the ticket for a fun filled adventure. 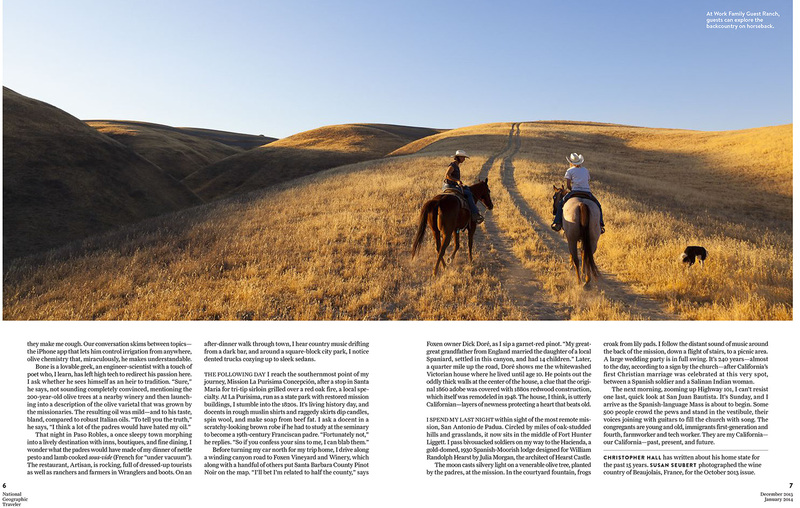 That’s exactly what my assignment was when I got the call from National Geographic Traveler Magazine. 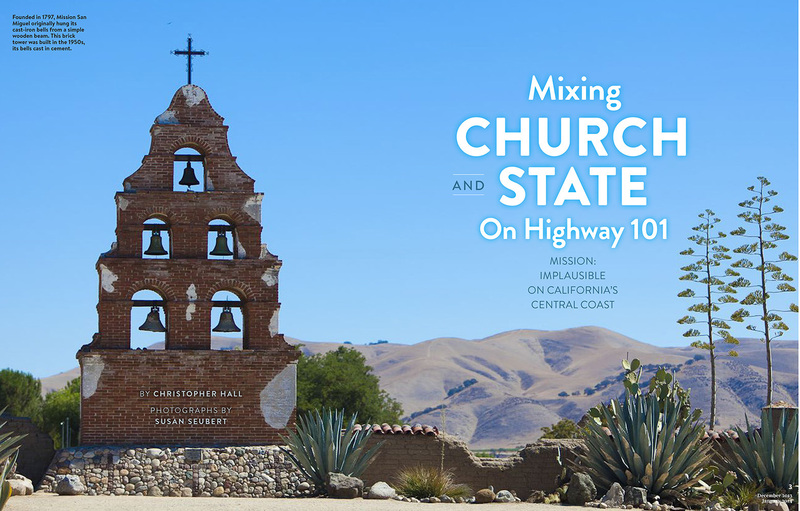 The magazine needed coverage of central California, specifically the missions, but also other things that tie into a road trip like wine tasting, food and a sense of the landscape. I set off on the opposite direction that the writer mapped out. My trip started just outside of LA and his started in San Francisco. In this case, it was possible to follow the footsteps of the narrative in reverse. 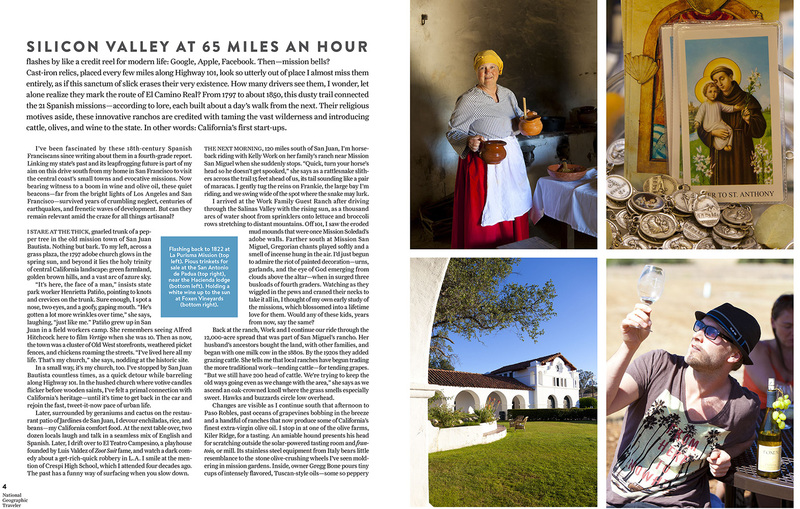 Over the course of this assignment, I visited four missions: San Juan Bautista, San Miguel, San Antonio and La Purisima. It was wonderful to roam the missions, attend services and learn about the history of this area. I also had the privilege to stay at the Hacienda Lodge located on an Army Base at Fort Hunter Liggett. I remember being exhausted when I arrived late at night, but because I had to enter an army facility, I was chosen for the “special” search of my vehicle on my way into the base. This historic property was once owned by the Hearst Family and is just on the other side of the fence from Mission San Antonio. To round out the story, I visited some amazing restaurants from the funky steakhouse, Jockos, to the really delicious Artisan in Paso Robles. I also toured and photographed an amazing olive farm called Kiler Ridge and did a little bit of wine tasting at Foxen vineyards. My personal highlight was visiting the Work Guest Ranch located in the hills just outside of San Miguel. I love horses and take every opportunity I have to ride. 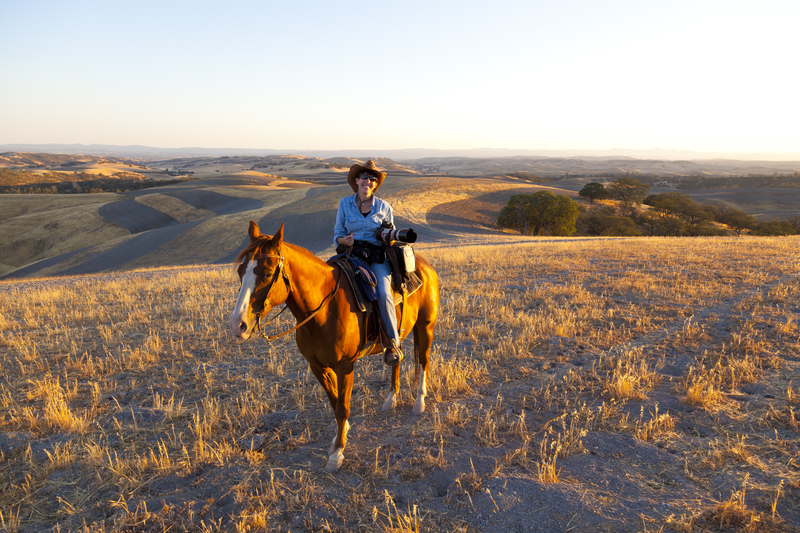 Although shooting while riding presents its own set of challenges, it’s supremely fun to ride around with the subject on the rolling hills of Central California at sunset. There is so much beauty in the world and I feel extremely privileged to have these adventures. The story is not online, so I’m posting it here. If you would like to see more pictures from this story, you can find them online here. Thank you for visiting! Shooting on horseback at sunset. I love my job! I love coffee. 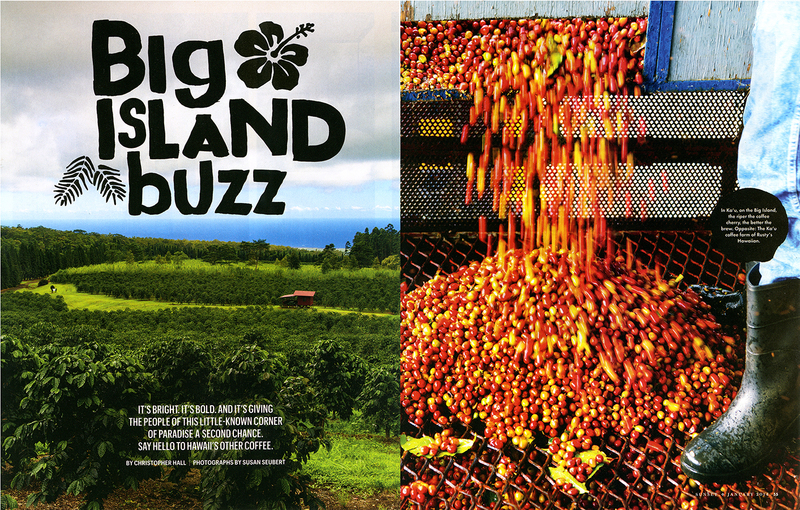 It’s part of my daily, morning ritual, yet until I recently photographed a story entitled, “Big Island Buzz,” for Sunset Magazine, I had never known much about the process of truly hand-harvested coffee. 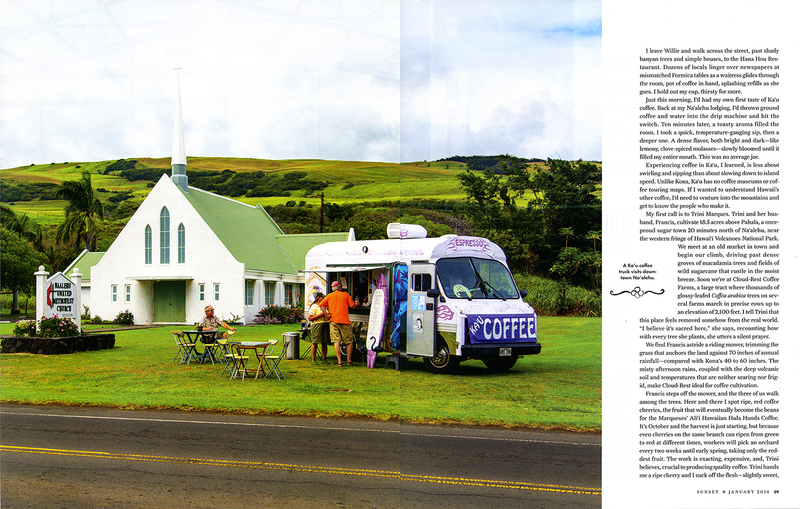 On the Big Island of Hawaii, in an area that is located on the flanks of Mauna Loa in the Ka’u district, you’ll find one of the best areas to grow coffee in the United States. The upper elevations of the Ka’u district have the perfect climate for the coffee plants. Those conditions combined with a wonderful group of devoted coffee farmers have landed this remote location on the international coffee map in recent years. I had previously only been familiar with Kona coffee, the famed Hawaiian coffee grown around the bend on the same island. The Ka’u area still feels somewhat untouched with it’s beautiful ocean views and sparsely populated villages. During my assignment, I met two farmers who methodically harvest the ripe “cherry” on land they work by hand. Willie and Grace Tabios, who produce the award winning “Rising Sun” brand coffee, hand pick the ripe cherry, then dry and process it outdoors at their home in Ka’u. Lorie Obra does the same, and along with her daughter Joan, produces another award winning coffee from the area called, “Rusty’s.” Both of these family run coffee farms have won international coffee competitions over the last few years and their beans now command top dollar throughout the world. 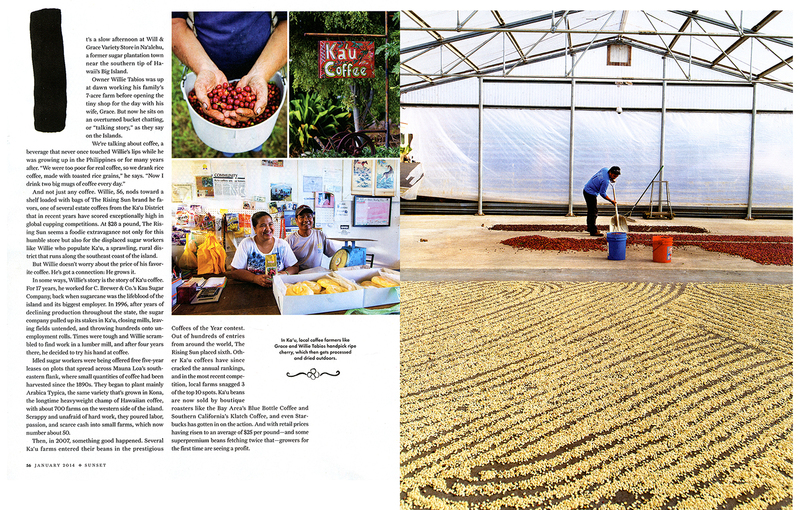 There is a wonderful place to see the entire process first hand in the small town of Pahala called the Ka’u Coffee Mill. There, I was walked through the entire process, from picking and processing the raw “cherry” to the roasted bean. They dry their beans by laying them out on a concrete slab outdoors. The mill processes both their own beans but also roasts for some of the locals. This facility is open to the public for tours. It was fascinating to see how the red, plump fruit was methodically turned into the warm cup of jo that I enjoy every morning. Of course, you can’t have a cup of coffee without something nice and sweet as an accompaniment. 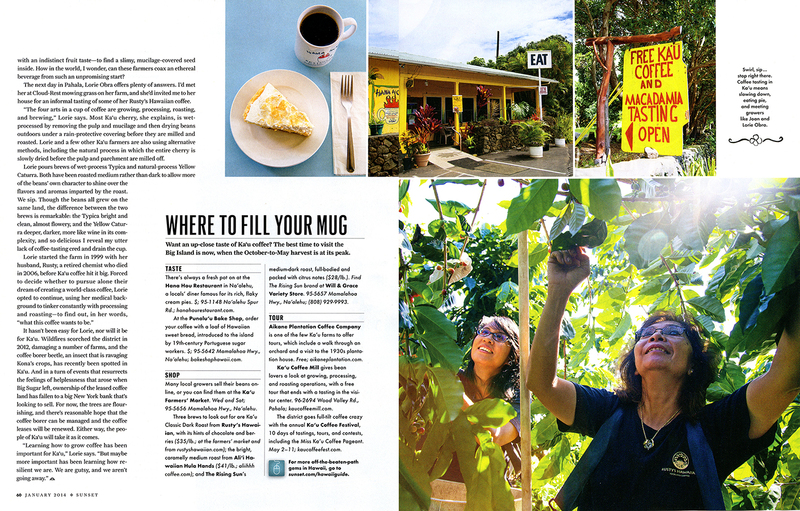 The Hana Hou restaurant, the southernmost restaurant in the US, offers a variety of delicious home-made pies along side a steaming hot cup of the local coffee. 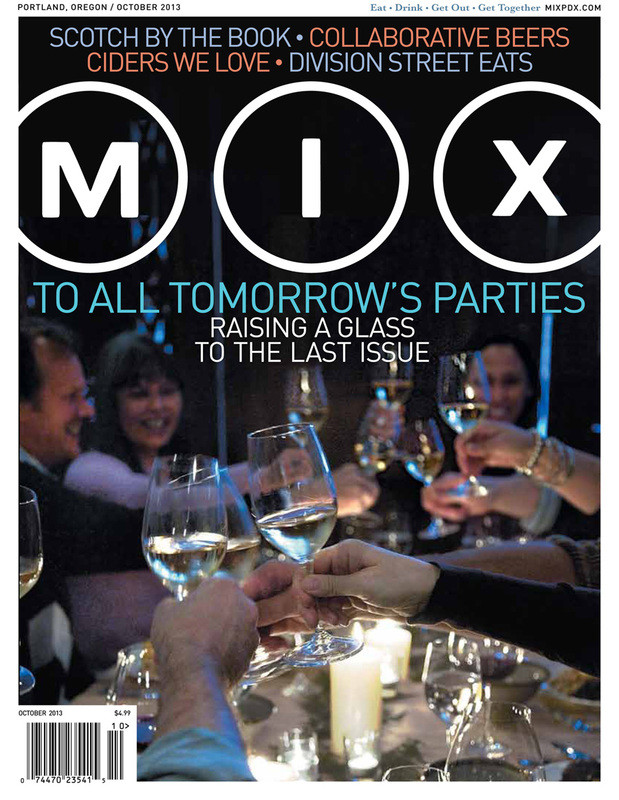 Although the article is not available to read online, I’ve put a copy of the story here for your perusal. If you would like to look at more photos of the story, you can see them on my stock photography site here. Mahalo for visiting!